Playing to a sold out crowd with many more devoted fans outside the doors in the cold, Imagine Dragons headlined the 5 Year Anniversary of our favorite– Velour Music Gallery. This show set the bar high for 2011 concerts…It set the bar high for any concert I’ve ever been to. The room was filled with beautiful looking college hipsters who bounced jubilantly off of the walls and ceiling. They pumped their index fingers and fists into the air and the chorus sang every last lyric back to frontman Dan Reynolds. Moreover, the atmosphere was palpable as guitarist Wayne Sermon swung his guitar into the air between exquisit guitar licks. The band emerged triumphant with guns blazing, breathing fire in the truest sense. Their lyrics didn’t fail and they surpassed even openers The Vibrant Sound musically. Really fun evening! It was fantastic to have them introduced with reference to their recent shows with bands like Interpol and The Temper Trap as well as upcoming Weezer concert. And, the crowd must have been impressed when they responded to the news that Imagine Dragons are featured in the most recent Real Salt Lake (pro US soccer team) commercials. Velour Music Gallery may very well be our favorite music venue. We love this place! The sound is great and ultimately the ambiance is incredible! The owner, Corey Fox, has effectively created an atmosphere for musicians. He brings in AMAZING talent night after night and always provides a powerful crowd. The joint is packed with college aged hipsters regularly. Also, there is no smoking or drinking. This is a clean venue and it is All Ages. The sound guy is always on point and the walls of the building don’t shake or fall down (even when reaching capacity or tempted by the greatest dancing fans on this side of the Atlantic). There are murals, brickwork, and toy horses hanging from the ceilings. 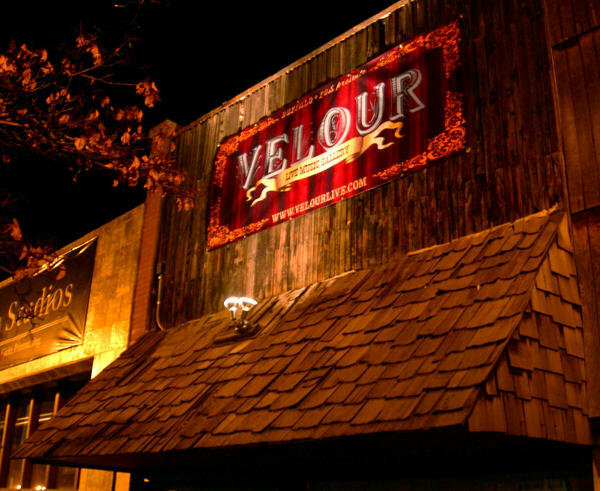 There is a warm mood at Velour akin to something from Dickens’ A Christmas Carol. It’s surreally splendid. Recent acts include: Location Location, Neon Trees (Mercury Recs), Paper Tongues (A&M/Octone Recs), Civil Twilight (Wind-up Recs), Imagine Dragons, The Non, Isaac Russell (Columbia Recs) Andrew Belle (Ten Out of Tenn), He is We (Framework NY Recs), Joshua James (Northplatte Recs), Parlor Hawk (Intelligent Noise/Northplatte Recs), Benton Paul, We Shot The Moon (Afternoon Recs), The Morning Benders (Rough Trade Recs), Sherwood (Sidecho/MySpace Recs), Teitur (Universal Recs), etc.